Is Peyton Manning A Corporate Tool? This isn't a personal opinion piece about Peyton Manning. This is about how media outlets have power to set the terms of a debate. I watched the end of the Seahawks-49ers game when Richard Sherman made one of the best plays I've ever seen in 30+ years of watching the NFL. I saw him mess with Michael Crabtree a little bit right after the play and then watched him make a "choke" gesture. And of course there was his "interview" with Erin Andrews. Can we really call that an interview? What's an athlete supposed to say in that spot? The expectation is that a player answer with boilerplate nonsense. Sherman went off script, and cue the manufactured debate. The morning after the game, the talking heads on sports radio were dutifully discussing Sherman and whether he disrespected the game. I listened in confusion. The NFL is entertainment. Many NFL players leave this game BROKE--their bodies destroyed, brains injured, and in a state of financial ruin. So let's not get too high and mighty about the NFL, I thought to myself. Back to Manning: he got thrown into some of these conversations that initially were about Sherman. Manning was positioned as the "classy" one. Manning apparently is the poster player for how one should conduct himself in the NFL. But why? What is it that he actually does that makes him classy? Is it what he says or doesn't say? Is he classy because he conforms to the expectations of many talking heads? What are the characteristics that make him so attractive to corporate America? Suppose an influential talking head decided to manufacture a debate about spokespersons for corporations. Imagine a media figure sparking a debate by declaring "Peyton Manning is a corporate tool. He is utterly boring." Picture other talking heads jumping in to agree or disagree with the initial formulation. "Gee Don, I don't think he's a corporate tool at all. Boring? Shut the front door! He's got acting chops! He's hilarious!" It seems to be taken for granted that Manning is a suitable spokesperson. But why exactly is he "relatable" to consumers? An honest question: is "classy" the default description for a white quarterback who sticks to the script? I do want to note I've heard some talking heads say positive things about Sherman, and have read pieces that took to Sherman's defense. So I've heard and read several things that present Sherman in a positive light. In the long run, Sherman might even pick up some endorsements. We'll see. In closing, the point of this piece is to wonder how it gets decided what a term like "classy" means and to whom that kind of label applies. What are the factors that lead talking heads to make subjective judgments like "classy"? Could it ever be the case (maybe it's happened and I missed it) that an influential talking head describe Manning as a tool of corporate America? Last semester in Introduction to Sociology, a student sent me the video for "Crooked Smile" by J. Cole (featuring TLC). He sent it to me around the time we discussed mass incarceration and the War on Drugs. In my course, I introduce students to the work of Michelle Alexander. It's a powerful and emotional video. The video is dedicated to Aiyana Stanley-Jones and concludes with the message "AND PLEASE RECONSIDER YOUR WAR ON DRUGS." Special thanks to my student (Deion) for making me aware of this video. My kids being cute and supportive in a video. I was nervous about a presentation I had to give that was open to the campus community. "I am convinced that if we are to get on the right side of the world revolution, we as a nation must undergo a radical revolution of values. We must rapidly begin the shift from a thing-oriented society to a person-oriented society. When machines and computers, profit motives and property rights, are considered more important than people, the giant triplets of racism, extreme materialism, and militarism are incapable of being conquered." -MLK in a speech against the Vietnam War. Click here for audio bit. Source: p. 340 in The Autobiography of Martin Luther King, Jr. Edited by Clayborne Carson (1998). Grand Central Publishing. Martin Luther King, Jr. - "We first must eat and have shelter to live"
"When all is finally entered into the annals of sociology; when philosophers, politicians, and preachers have all had their say, we must return to the fact that a person participates in this society primarily as an economic entity. At rock bottom we are neither poets, athletes, nor artists; our existence is centered in the fact that we are consumers, because we first must eat and have shelter to live. This is a difficult confession for a preacher to make, and it is a phenomenon against which I will continue to rebel, but it remains a fact that "consumption" of goods and services is the raison d'être of the vast majority of Americans. When persons are for some reason or other excluded from the consumer circle, there is discontent and unrest." Source: p. 295 in The Autobiography of Martin Luther King, Jr. Edited by Clayborne Carson (1998). Grand Central Publishing. In this part of the book is King's reflection on the 1965 Watts rebellion in Los Angeles. King went to Watts a few days after the rebellion ended. I was mystery reader for my son's first grade class. The kids knew that a parent was coming but they didn't know who it would be. They got hints about me by learning about five things I like. 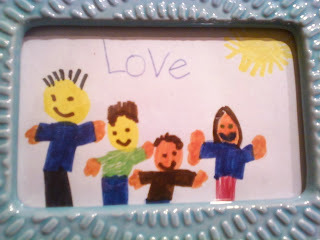 Before I arrived, they were informed that my favorite things include baseball, books, autumn, pizza, and Despicable Me. I thought I should put a kids movie on the list. Know your audience and all that. I showed up and read a funny little book about worms. I loved it when the kids laughed. Step back, before I read the book my son introduced me and told them I'm a sociology professor. 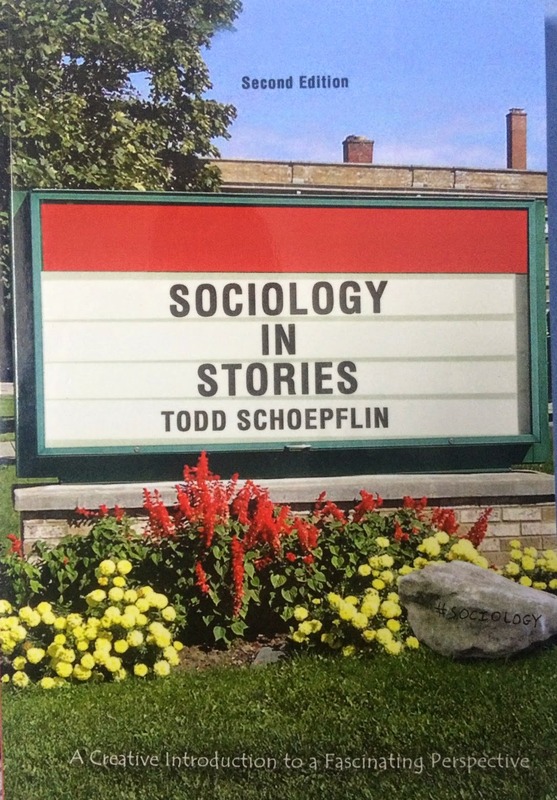 He told his classmates that sociology is the study of big kids. I love that kid. After I read the book the kids were allowed to ask me questions. I didn't know this was coming. I loved every minute of it. Kids ask the best questions. Do you like dogs? Where did you grow up? Do you like worms? What's your favorite color? I told them my favorite color is red because for most of my life that's been true. After I gave my answer I said something like "But I really like orange too. Maybe it's orange." Come to think of it, I think orange is my favorite color. And I still like red. The End. Martin Luther King, Jr. - "All labor has dignity." "One day our society will come to respect the sanitation worker if it is to survive, for the person who picks up our garbage is in the final analysis as significant as the physician, for if he doesn't do his job, diseases are rampant. All labor has dignity." Source: pp. 352-353 in The Autobiography of Martin Luther King, Jr. Edited by Clayborne Carson (1998). Grand Central Publishing. Note: In March 1968, the month before he was assassinated, King went to Memphis to support 1000+ sanitation workers on strike. "Power, properly understood, is the ability to achieve purpose. It is the strength required to bring about social, political, or economic changes. In this sense power is not only desirable but necessary in order to implement the demands of love and justice. One of the greatest problems of history is that the concepts of love and power are usually contrasted as polar opposites. Love is identified with a resignation of power and power with a denial of love. What is needed is a realization that power without love is reckless and abusive and that love without power is sentimental and anemic. Power at its best is love implementing the demands of justice. Justice at its best is love correcting everything that stands against love." Source: pp. 324-325 in The Autobiography of Martin Luther King, Jr. Edited by Clayborne Carson (1998). Grand Central Publishing. "Lamentably, it is an historical fact that privileged groups seldom give up their privileges voluntarily. Individuals may see the moral light and voluntarily give up their unjust posture; but, as Reinhold Niebuhr has reminded us, groups tend to be more immoral than individuals. We know through painful experience that freedom is never voluntarily given by the oppressor; it must be demanded by the oppressed." -Written in April 1963 in response to eight clergymen critical of demonstrations in Birmingham and the nonviolent campaign for justice. Source: page 191 in The Autobiography of Martin Luther King, Jr. Edited by Clayborne Carson (1998). Grand Central Publishing. Tina and I have been married nine years. So that's something like 3000 nights together. I would guess we've gone to bed at the same time for 2750 of those nights. It's a rare night when we're in separate spaces before bedtime. Not feeling well, she went to bed to read for a bit before an early lights out. The kids were already settled in bed. That left me with myself. There's nothing on the television, so the only thing I could think to do is look up Oscar Gamble's career statistics. I've been meaning to do that. So I did and then wrote this little story. It won't win any awards. The end. 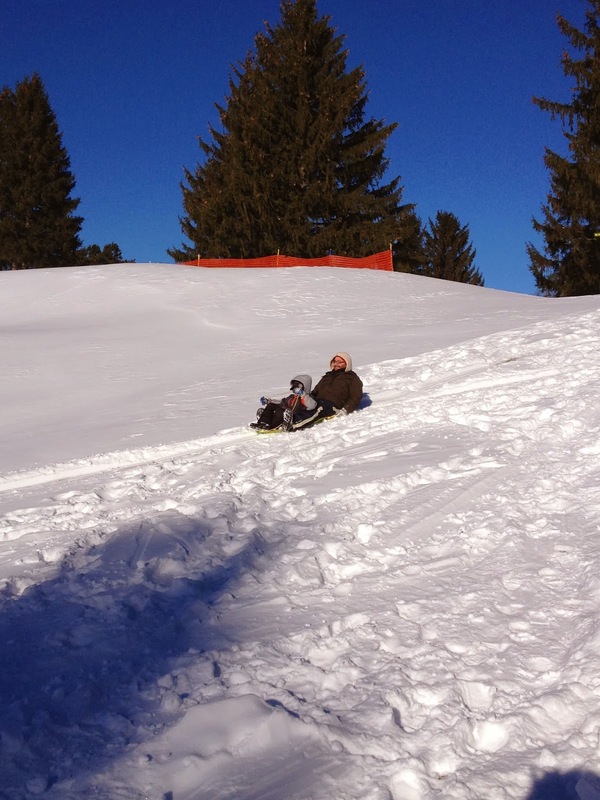 A morning of sledding with the family, lots and lots of fun. Everything costs so much these days, have to pay megabucks to buy a thrill, so nice to take a plastic sled and shoot down the hill a bunch of times at a place that's open to the public. Here's Troy and me having some fun in winter sun. 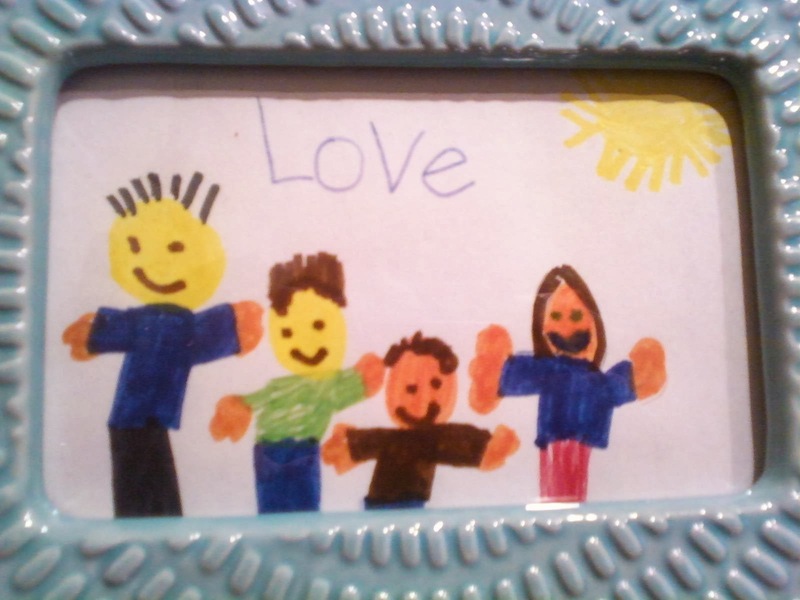 Yesterday, our six-year-old son drew this family picture. That friend from long ago, the one who could never follow through, all of a sudden he seemed able to do it all. He was always most involved with himself. He still is, in a way, devoted to himself. But I am hopeful he will spend more time looking beyond his needs. As for me, well let's not worry about me, I am up on my luck. I've always had a lot of good cards in my hand. Complaints can be made, but you'd be fortunate to have this house of cards. The end. Author's note: This is fiction.